Liz's Paper Loft: MCT June Release Blog Hop ~ hi! Well we finally made it the hop! 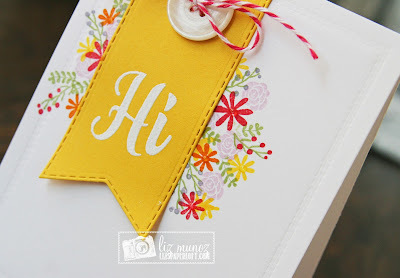 Welcome to My Creative Time June Release Blog Hop, you should have arrived here from the talented Miss Kim. If you just popped in to see me, then be sure to head to the start at Miss Emma (our fearless leader). First I dry embossed the Rectangular die on my card base. Then after I heat embossed the sentiment on the label, I scored it instead of cutting it off at the top. Then I folded it over the card, so the back a bit of interest. Starting THIS Friday, June 17th, 2016 @ 8am PST ~ Our "Freebie" for this release is this ADORABLE "Fun Polka Dots" Stamp set. It will be given to the FIRST 100 shoppers! If you are one of the 1st 100 shoppers it will be automatically added to your package at the time of packaging/shipping. Once 100 shoppers come through, this die will be available for purchase. So, if it’s for sale in the store, you are not one of the 100. No exceptions will be made. This freebie set is not a part of the “bundle” and will be sold separately! ALSO, DON'T FORGET our sale starts RIGHT NOW here:http://shop.my-creative-time.com/Ne...! Use the code: JUNE2016 to receive a discount off your entire purchase! This sale applies to "IN-STOCK" items ONLY. This sale will end on Fri, June 24th, 2016 @midnight PST. OMG.... SOOOO BRIGHT & CHEERY & perfecto!!!!! GREAT job my friend! Thank you for your AWESOME sneaky peeks this entire week! OMG Miss Liz What a Gorgeous Card!!! Your flowers are so beautiful and love how you did the tag. Your embossing turned out fabulous...in a word WOW!!! You so did a super outstanding creative job!! YOU so ROCK!! Such a beautiful card!!! I love that sweet arrangement of florals underneath the sentiment! So pretty! Thank you for sharing and giving me so many ideas! Darling and sweet card! That beautiful cluster of flowers really showcase the banner! Terrific card! What a pretty card! Such happy fun colors!! Love it!! wow your card is so beautiful!!!! Your card looks FANTASTIC! 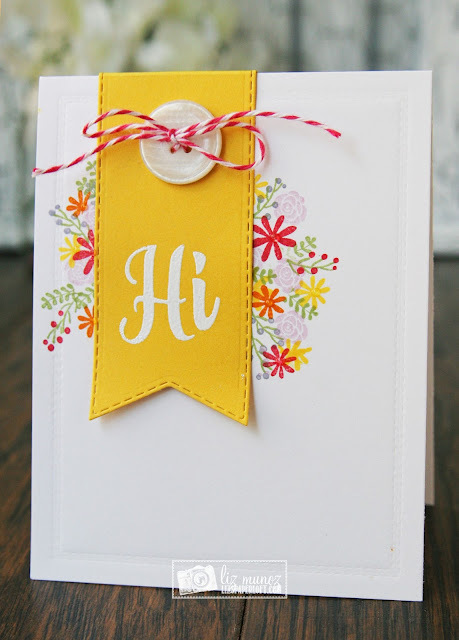 Love how you used the new die cut. I had to look twice, your flowers look amazing! I thought they were embroidered at first on the card and then I read further and saw that you used a stamp. Beautiful! Your card is just gorgeous! I love the banner and the flower colors are beautiful. Beautiful! Love how bright it is! Beautiful flowers and I love the HI sentiment:). Thank you for sharing! 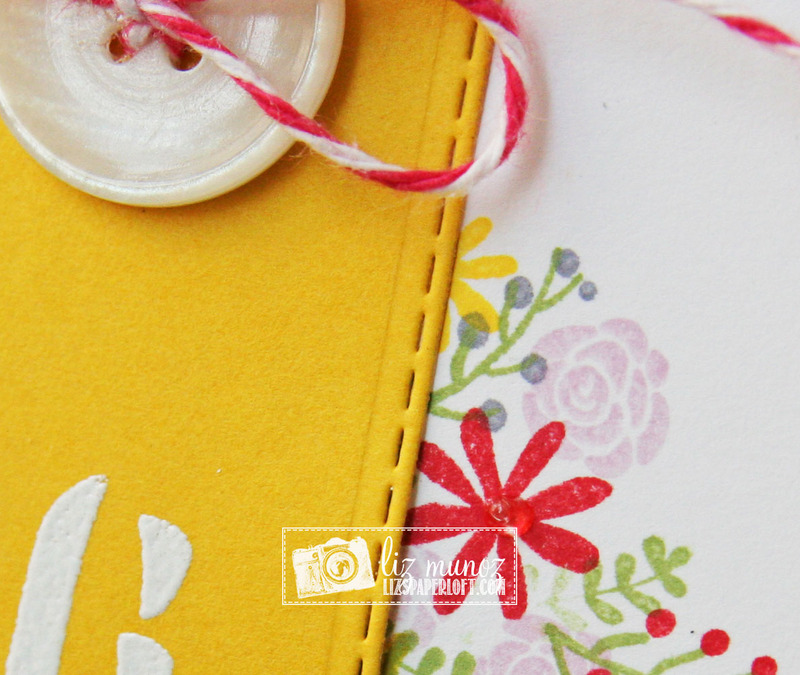 This is such a pretty, cheerful card, Liz!!! Love it! Very cheery --I like the Hi banner. Thanks for sharing your sweet card. LoVe how your flowers are peeking out from behind your sentiment. Love the cheery colors! Great card! Simply Beautiful! Love your card. The yellow is so bright and happy with the big sentiment. I also love the sweet flowers you arranged behind the label die. Darling!